Tombstone is an ambitious account of the legendary gunfight at the OK Corral. However, a stellar cast giving peak performances can’t keep the movie’s wagon train from getting stuck in the mud on the a meandering storyline that veers from violent Western action to family drama and back again. Under the direction of George P. Cosmatos (Rambo: First Blood Part II), the filmmakers would have you believe Tombstone is one of the most definitive Westerns ever made, with everybody in the cast and crew doing their homework on the time period and the characters. But just because the cowboys wear dirty clothes doesn’t mean the careful attention to detail can overcome a dully told story. That’s not to say Tombstone is without merits. There’s a lot that can be admired about the production, particularly the photography by William A. Fraker (Rosemary’s Baby) and the performance of Val Kilmer (Pollock) as Doc Holliday. Kilmer gives Doc a slimy, unbalanced, wildcard edginess that makes him always interesting to watch. Overall, the casting is superb and features several nifty cameos, including an unrecognizable and pudgy Billy Bob Thornton (Bandits) as a curmudgeon named Johnny Tyler. Kurt Russell (Big Trouble in Little China) as Wyatt Earp turns in a fine portrayal of the legendary Marshall, showing he might not have been as straight-laced as he’s been depicted in the past, particularly with the handling of his drug-addicted wife, Mattie (Dana Wheeler-Nicholson, Fletch). However, it’s the subplots of Earp’s wife and his blossoming love interest in Josephine Marcus (Dana Delaney, TV’s China Beach) that bog down the pacing of the film. Rather than painting a complete historical picture, the film turns into a splotchy piece of work that is partly vibrant and partly lackluster. 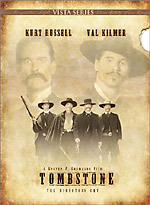 The Vista Series two-disc edition of Tombstone features the director’s cut, but that cut includes only four minutes of additional, yet worthwhile, footage. The DVD is also loaded with supplemental features, but their cumulative worth is limited. The most notable of the features is a well-spoken and informative running commentary from director Cosmatos. It’s among the better DVD commentaries as Cosmatos shares his unabashed enthusiasm for the project and slips in bits of Western history, film history, and anecdotes from the set. However, the 27 minutes of behind-the-scenes footage and interviews found on Disc 2 drifts too far to the side of self-congratulatory, everybody’s-been-great-to-work-with fluff. There’s also a timeline of the historic events at Tombstone, which offers text for viewers to read accompanied by the annoying narration of a stereotypical old coot from the prairie. It might be informative, but it’s slow going to navigate through the one-factoid-at-a-time format. Regarding the gunfight at the OK Corral, the DVD includes a fairly superfluous 4-minute section that features the storyboards of the film’s recreation of the event set to music. More interesting is the disc’s inclusion of a reprint of the original Tombstone Epitaph newspaper account of the historic gunfight. The set’s sole DVD-Rom supplement is a solitaire-like game of Faro. Players are first required to answer five trivia questions about the film before proceeding to the card game. It’s kind of like trivia night and poker all rolled into one, once again accompanied by the annoying narration of the stereotypical old coot. Nobody should be in danger of getting addicted to this game. Disc 2 also features an Easter Egg. On the Bonus Materials menu, right click and a star will appear in the lower right corner of the screen. Select the option to enter an Image Gallery featuring 36 sketches and poster art. Rounding out the programming portion of the package are two trailers and seven TV commercials for Tombstone along with a trailer for Pearl Harbor. The THX-certified picture and sound are well done. Presented in widescreen 2.35:1 anamorphic format, the picture is crisp, clear, and artifact free. The sound, available in both DTS 5.1 Surround and Dolby Digital 5.1 Surround, packs plenty of punch, particularly during the gunfights and when the film’s score enters its more robust moments. The DVD also provides English, French, and Spanish subtitles.